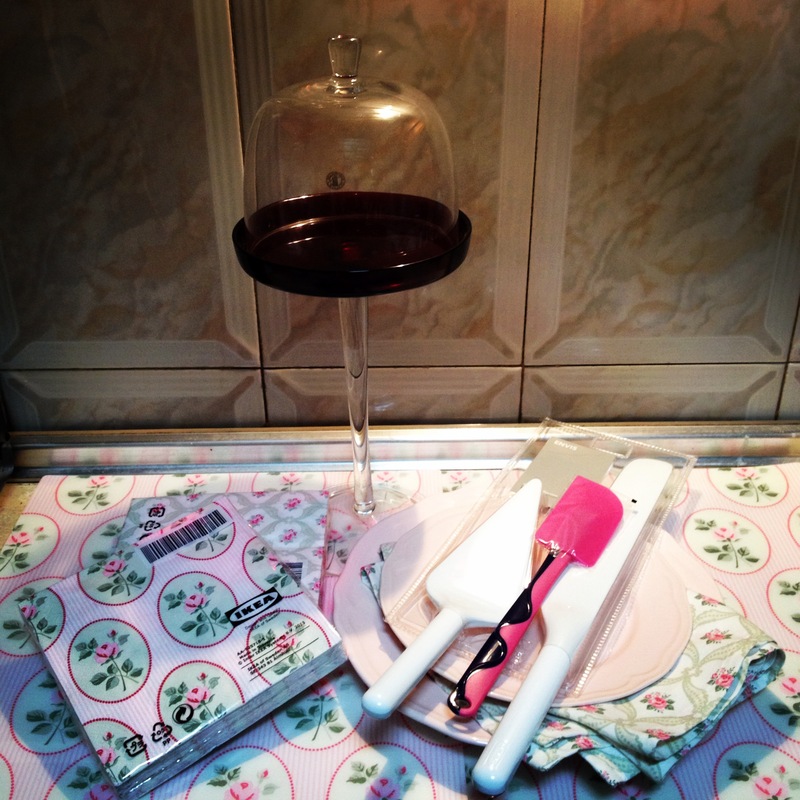 Cupcakes & unicorns | The magnificent adventures of a baker wanna-be! 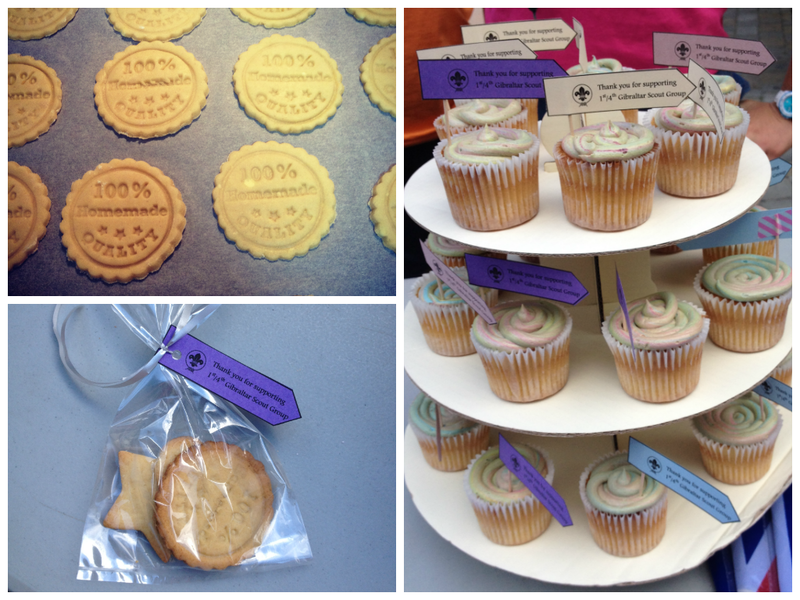 The magnificent adventures of a baker wanna-be! The cupcakes came out beaitufully moist and rich and I topped them up with my favorite Hummingbird Bakery cream cheese frosting and little wine bottles made of fondant. What a treat after drinking plenty of vino! Recipe below. But today I nipped into a local pound shop to check out if they had any boxes I can use to carry the cupcakes in, and found The Solution to my problem. 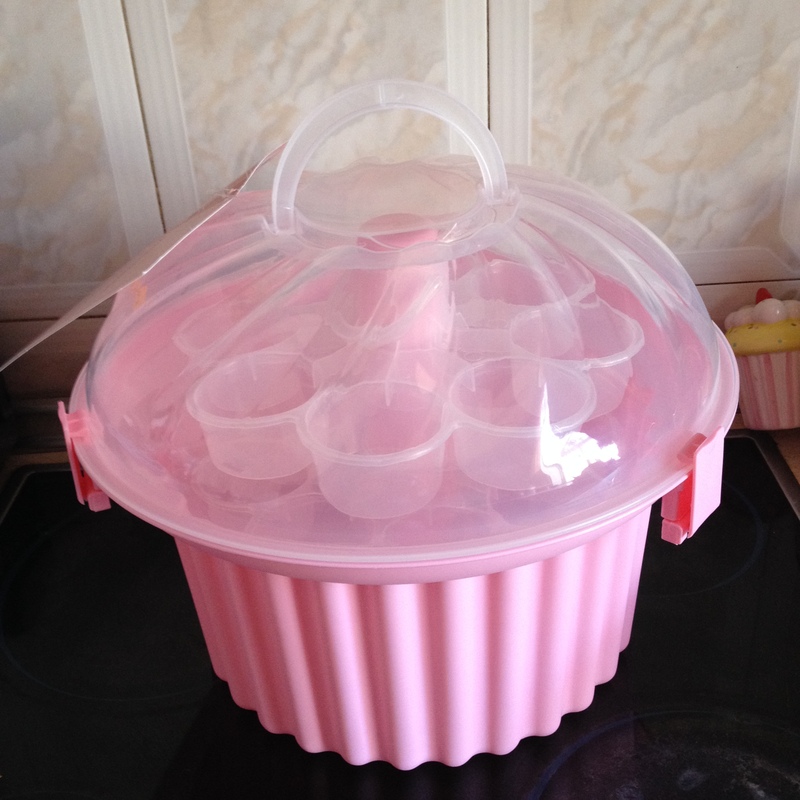 Just look at this beauty: For a few weeks now I had been eyeing this cupcake caddy on Amazon. But while we are considered UK for anything else, delivery to Gib is not the easiest things of all. It takes ages, costs a fortune or is not possible at all for bulky/heavy objects. 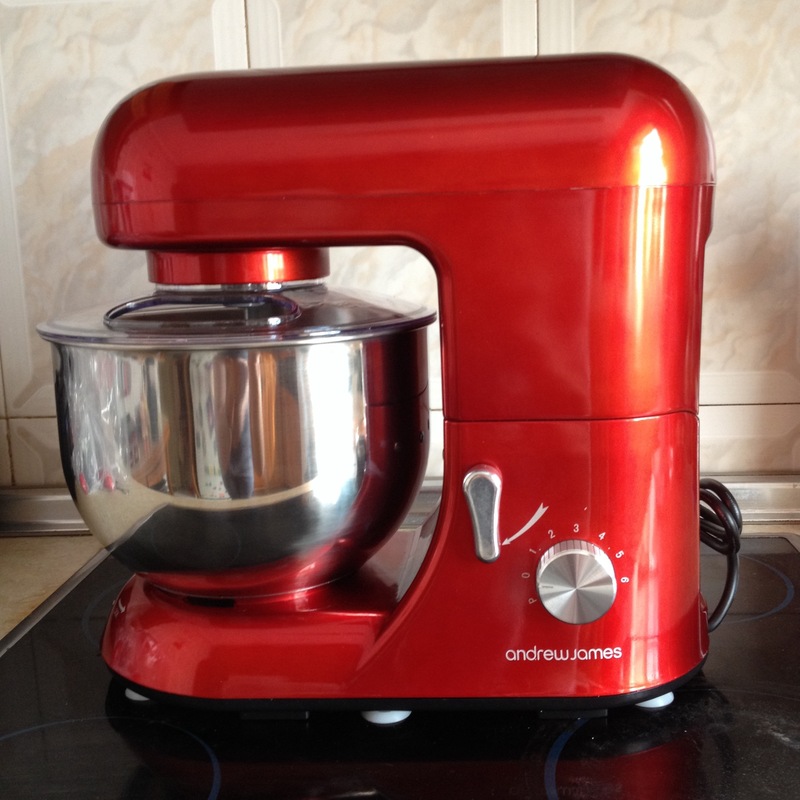 I decided not to go through the stand mixer drama again and gave up. So imagine how I felt today when I saw it!!! Insta-buy, obviously. So I had all those posts planned in my head… Mother’s day (in March where I am based), Easter, etc. But now it’s been way after each of these events so I decided to forget about the plan and post everything backwards. 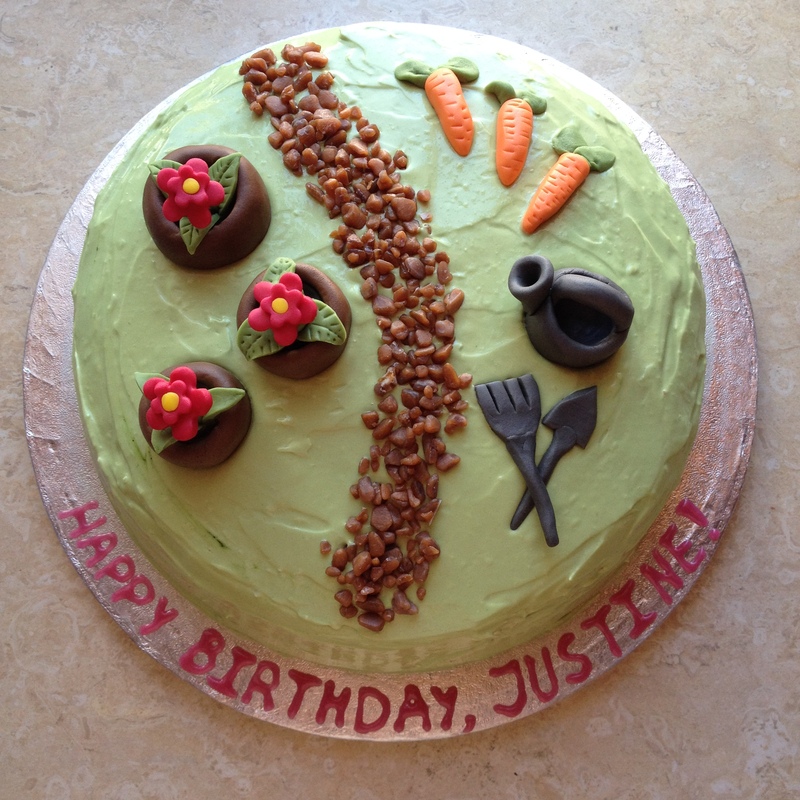 Starting with my latest baking creation: a birthday cake for a keen gardener! I loved making all the decorations but my favorite is the watering can. Too much cute, I think! I am still here and still baking, by the way. I know I have been seriously slacking off around here but loads of baking, 3 business trips in the last 4 weeks, loads of other activities, fostering a tiny kitten and trying to have a social life really took its toll. I am really looking forward to this coming (long, thankfully) weekend which also happens to be Easter weekend. This means 4 days off in which I hopefully manage to catch up on sleep, visits to Spain, maybe a BBQ (weather permitting), and best of all, time to blog! 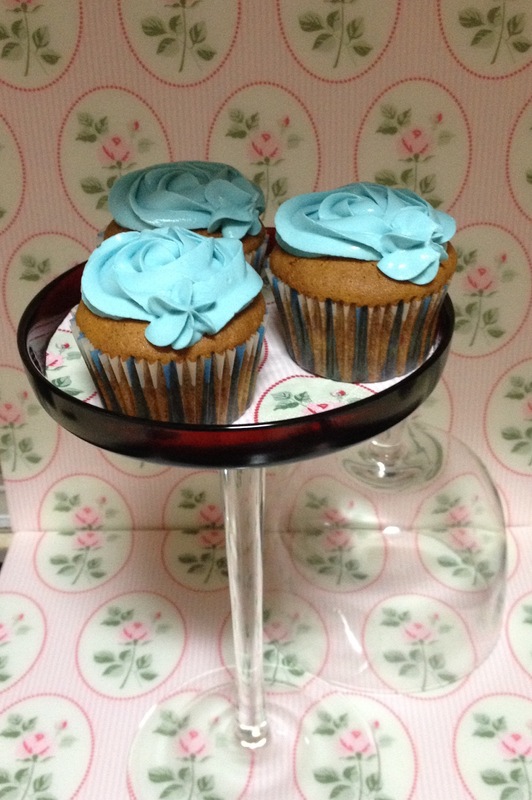 Gluten free cupcakes and a sneak peak! Today I have 3 exciting stories to share! 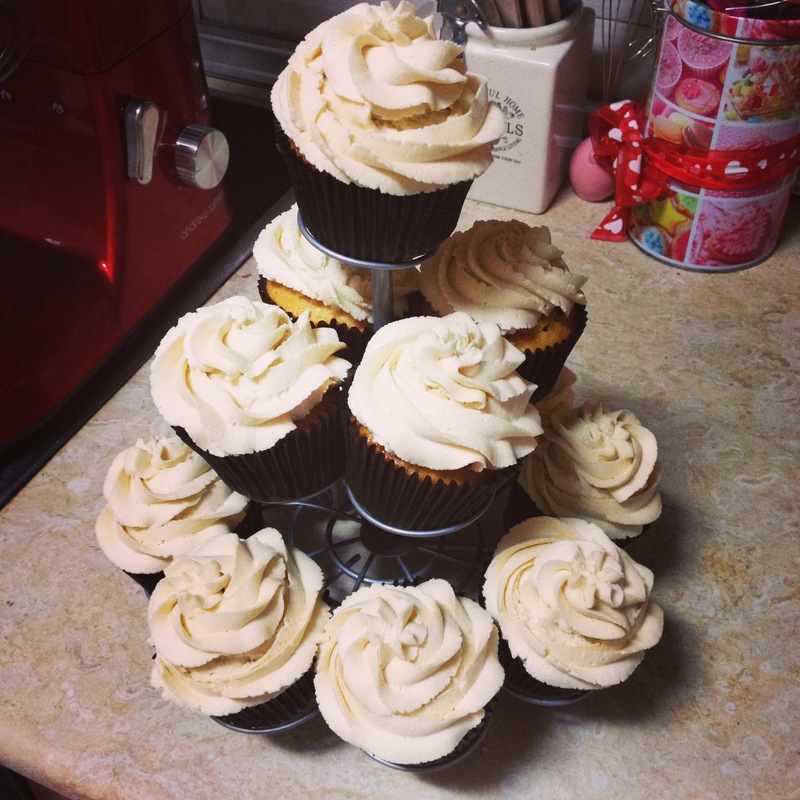 4 actually if we count I finally was able to produce (and reproduce) cream cheese frosting which I was able to pipe! ButI think I will dedicate a separate post to this as it is a huge milestone! I have been wanting to try gluten free baking for a while. This Saturday I was finally brave enough to attempt it. I used my favorite white chocolate and strwaberry cupcake recipe and simply replaced the plain flour with gluten free one (it was made of corn). My baking powder is anyways gluten free and the rest of the ingredients are safe. I was very nervous because I had never really looked into gluten free baking and wasn’t sure if just substituting the flour would give me the desired result or something else had to be done. But I followed my gut and ended up with these delicious beauties. Success! 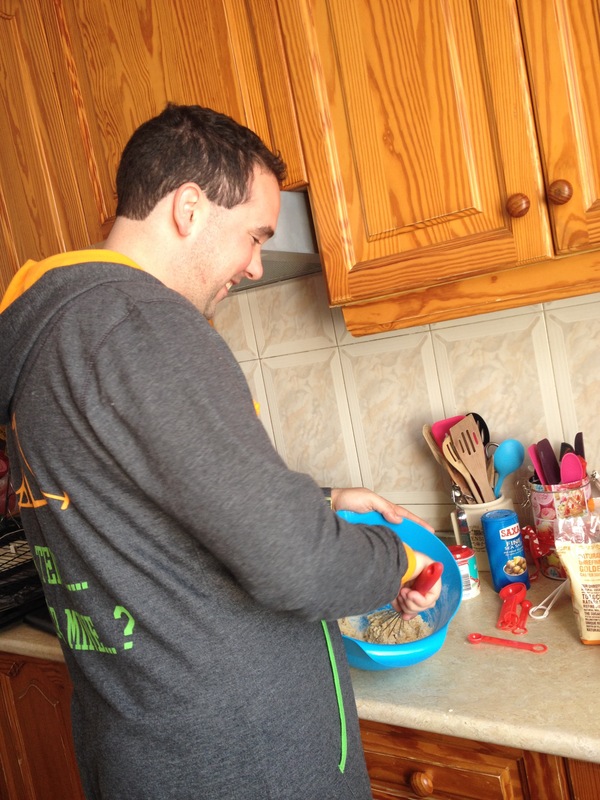 So my other half has been saying he’d like to me to teach him to bake. At first I thought he’s joking but he asked me again this week so today, he baked his first ever batch of cupcakes and I only helped chop the strawberries, he did everything else himself. They came out amazing! So proud of him! In my last post I talked about my photography drama. But then awesome Whitney came along and said she’s itching to take photos of food (she prefers it to taking photos of people – aren’t I lucky to have such friends??? ), and I happened to have some cupcakes and we ended up arranging a mini photo shoot in the kitchen this afternoon while drinking coffee and chatting. She is working on the photos and I haven’t seen them even on the camera so I am totally excited to see them soon and share a few here! On a different note, I am off to Vienna tomorrow for a week so please bare with me. I will be back soon enough! I’ve just popped the second and final batch of strawberry and white chocolate cupcakes in the oven and am contemplating a midnight-ish run to the supermarket (yes, it will be nearly 10pm by the time cupcakes are done, and yes, I am crazy but a supermarket kind of nearby now works till 12am so who am I to not take advantage of these new working hours, especially if I <sarcasm>so thoughtfully</sarcasm> forgot to buy the cheese for the frosting). 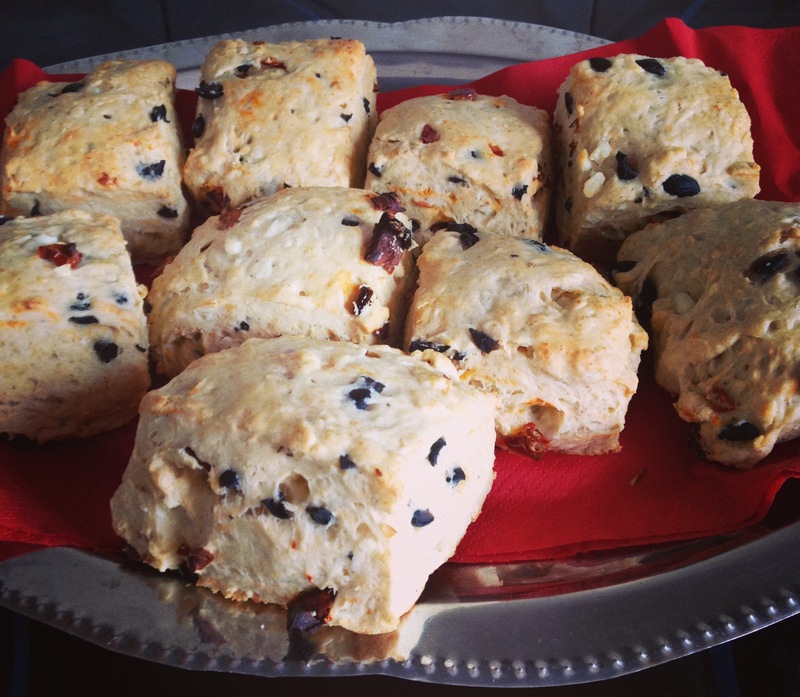 And while the magic is happening in the oven and because I don’t want my dear readers to get diabetes from only reading my blog, I thought I’d share the result and recipe for my first (savory) attempt for scones. The recipe is courtesy of a Marks & Spencer’s baking cookbook and if you are lucky to have tried the Marks & Spencer’s food, you will know they know what they’re doing! First preheat your oven to 220 degrees Celsius. If you have a baking sheet, grease it with a little butter. If not, line a tray with baking parchment (no need to grease it) – I used the parchment and it works just fine. Then sift the flour and salt in a large bowl. Now prepare to get messy: You need to add the soft butter to the flour and mix with your hands until it all looks like crumbs. The add the olives, feta cheese and tomatoes and mix it all. Start adding the milk, a little at a time, while kneading the dough. Your hands would be pretty sticky at this point, so pre-measure it (or call someone, if available, to help) in order to avoid having to wash your hands a million times. You need to have a soft (and not too sticky) dough at the end so knead until then. Roll out until you have a 3 cm thick sheet of dough – don’t worry, it won’t be all nice and smooth. Cut with round cutters or if you cannot be bothered like me, in squares, about 5-6 cm wide. Brush with milk, put on tray/baking sheet and bake for 12-15 minutes or until golden. 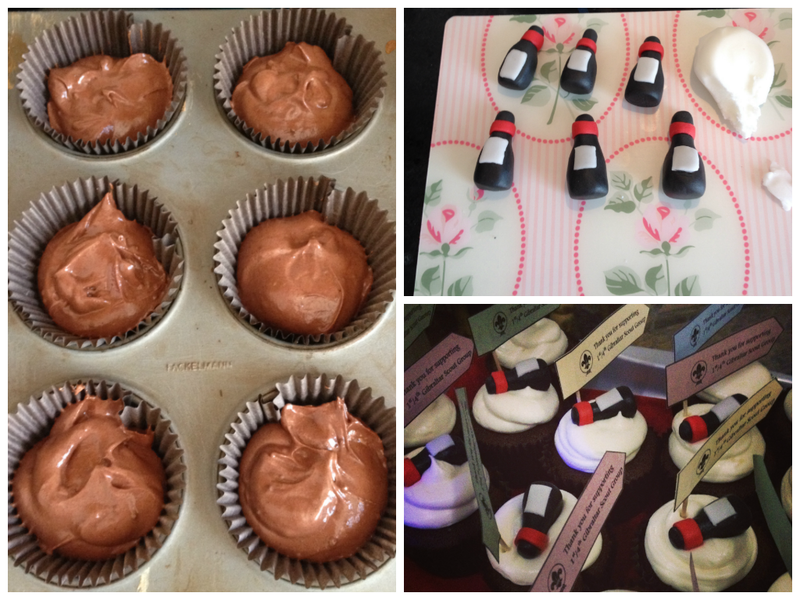 My first cupcake order – EEEK! Something very exciting happened to me last week! Until now baking was just a very enjoyable hobby of mine but I happened to receive my first cupcake order!!! 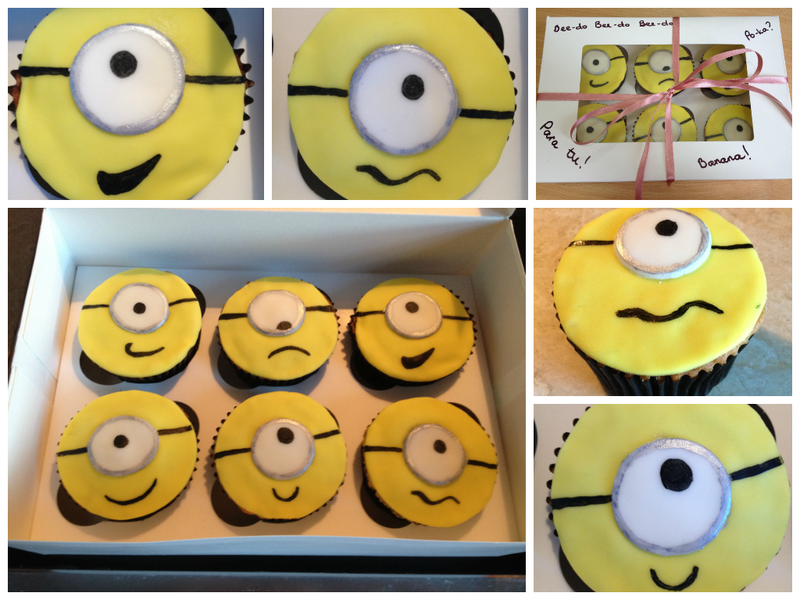 At first I nearly said no: It was rather last minute, I had been already overly busy and it was for minion cupcakes – and I’d never attempted such fancy designs! Could this be the first of many orders? I think only time will tell. 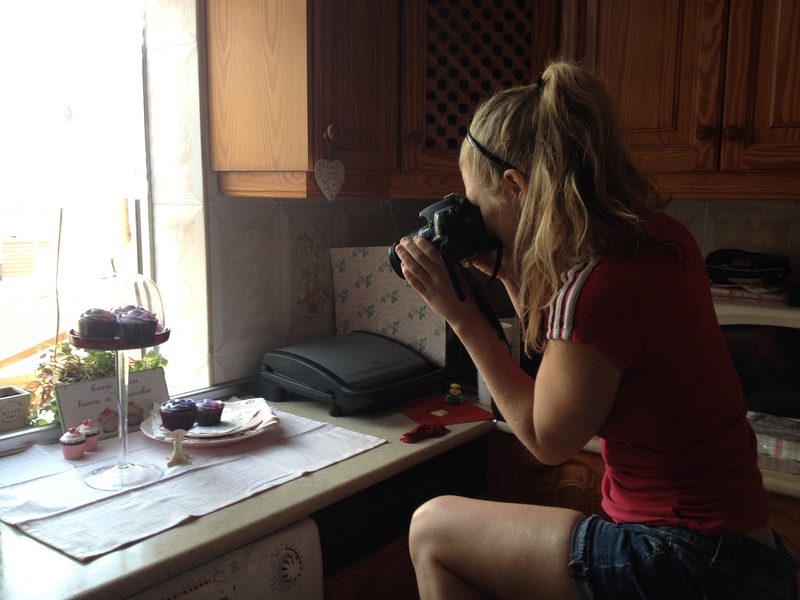 Vanina on A cake picnic!